Heat the fat in a large soup pot over medium heat. Add the onion, celery, cabbage, and carrot and saute 5 minutes until softened. Add the diced tomatoes, broth, dill, paprika, and a sprinkling of salt. Bring to a simmer. Cook, partially covered, for about 25 minutes until cabbage is soft. Add the potato and cook another 10 minutes. While the soup is simmering, mix together the chicken, breadcrumbs, shallot, egg, salt, pepper, and dill. Form into small balls. Drop the meatballs on top of the soup. Cover pot completely and continue cooking for about 15 – 20 minutes. 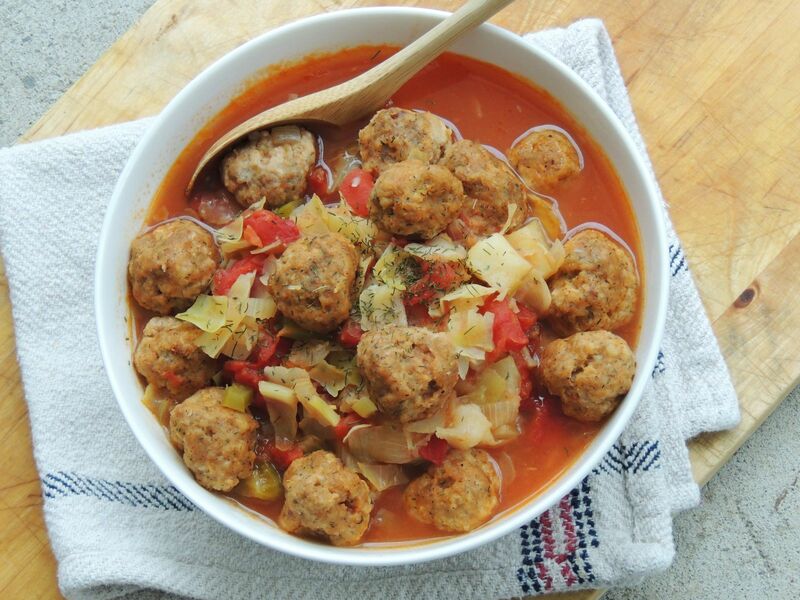 Remove lid and stir meatballs into soup. Taste and add additional salt and black pepper if needed.